The Denmark-flagged Meridian Spirit carrying 120,000 tons of cargo docked at Dabhol on March 30, 2018. 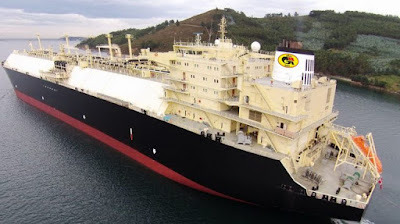 GAIL hired the ship in September 2017 to transport gas from the US. The 165,500 cbm Meridian Spirit arrived after 25 days of voyage and docked for unloading. Speaking on the occasion, Shri Dharmendra Pradhan, India’s Minister of Petroleum and Natural Gas, said that the government was working towards making India a gas based economy. He added that the arrival of the first LNG cargo from the US was a significant milestone in the direction of realizing adequate availability of natural gas through imports from diversified sources. GAIL is one of the early movers to contract US LNG and has 5.8 MMTPA of US LNG in its portfolio. GAIL shall be receiving around 90 cargoes per annum from Sabine Pass and Cove Point LNG terminals, according to the company. The arrival of the LNG vessel coincides with the formation of Konkan LNG Private Limited, a subsidiary of GAIL. The newly established company plans to invest INR 30 billion (around USD 461 million) in Dabhol LNG terminal in order to double the capacity of the facility to 10 million tons in the next three years, The Economic Times reported.